Fractionation is the process of taking clients in and out of trance in order to deepen the hypnotic state. Each time they go back into trance they will go even deeper than the previous time so it isn't always necessary to use a separate deepener. The script also uses a short sunset deepener, however if your client has already indicated that they are in trance then it's not essential to use this. 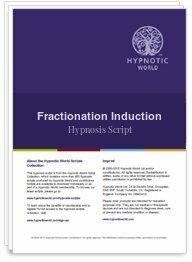 This Fractionation Induction and Deepener hypnosis script is marked in specific places where emphasis can take place in order to create embedded suggestions and should be matched with your subject's responses. The script prompts a yes-yes response to help achieve a deep hypnotic trance to form a basis for your important therapeutic work. The script should be followed by whichever suggestions you have agreed with your client.